As an outcome of the peace agreement of the Bougainville conflict, the Autonomous Region of Bougainville has its own constitution which gives significant autonomy over its own affairs, unlike any other part of PNG. However, the constitution is subject to the constitution of Papua New Guinea and the national government retaines key powers, such as defence and foreign relations. The Supreme Court of Papua New Guinea remains the highest court in Bougainville. In this way, the arrangement between Bougainville and the wider Papua New Guinea is broadly similar to that between Australian state and federal governments. The head of the Autonomous Government has the title ‘President’.
. Judicial – the Bougainville Courts including Supreme Court and High Court. The Judicial powers are still reserved by the Papua New Guinea Government. 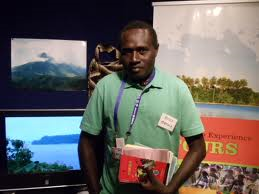 The first election was held from May to June 2005 with the formation of inaugural Autonomous Bougainville Government led by President Joseph Kabui and Joseph Watawi as Vice President. Mr. Kabui died in June 2008 and was succeeded by James Tanis in November 2008. John Tambinaman was the acting President with Mathias Salas as the acting Vice President from June to November 2008. John Momis is the President of the second House of Representative. The second ABG election was held recently from May to June 2010.